Resisting the typical, dry methods of contemporary scholarship, this powerful examination revisits the biblical days of life-and-death conflict, struggles for power between popes and kings, and secret alliances of intellectuals united by a desire to pit worldly goals against the spiritual priorities of the church. This account looks beyond the pretense of neutrality and objectivity often found in secular study, and brings to light the appropriation of scripture by politically motivated interpreters. Questioning the techniques taken for granted at divinity schools worldwide, their origins are traced to the writings of Machiavelli and Marsilio of Padua, the political projects of Henry VIII, Thomas Hobbes, and John Locke, and the quest for an empire of science on the part of Descartes and Spinoza. Intellectual and inspiring, an argument is made for bringing Christianity back to biblical literacy. Scott W. Hahn holds the Fr. Michael Scanlan Chair of Biblical Theology at the Franciscan University of Steubenvile, where he's taught since 1990. He is also the Founder and President of the St. Paul Center for Biblical Theology, and the author/editor of over forty books, including Kinship by Covenant, The Kingdom of God as Liturgical Empire, Canon and Biblical Interpretation, Covenant and Communion, The Catholic Bible Dictionary, and The Lamb's Supper. 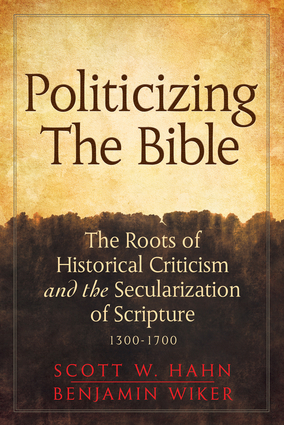 Benjamin Wiker is an author and a senior fellow with the Envoy Institute of Belmont Abbey College, the Discovery Institute, and the St. Paul Center for Biblical Theology. Among his books are A Meaningful World: How the Arts and Sciences Reveal the Genius of Nature, Answering the New Atheism, and Moral Darwinism. He lives in Hopedale, Ohio.